George Graham Reviews Norah Jones' "Come Away with Me"
In recent years, the chanteuse, the jazzy, somewhat romantic female vocalist has been making a significant comeback. In the jazz world, it seems that almost every other album being released is by a songstress. The success of Diana Krall, and the recent sensation being created by Jane Monheit have helped to pave the way for a spate of worthwhile jazz women of song. Likewise the chanteuse has been a phenomenon on the pop music scene for generations, going back to the original popularity of jazz. From Billie Holiday to Peggy Lee to Patsy Kline to k.d. lang, some outstanding singers, who may not have been songwriters have made their mark on the music world with their distinctive performances imbued with plenty of style. 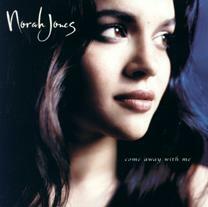 Norah Jones is another chanteuse has made a very impressive solo recording debut, a CD called Come Away with Me. Like Jane Monheit, Ms. Jones is quite young, born in 1979, making her 22 when this CD was recorded last year. Unlike many of the jazz singers who are emerging, Ms. Jones does mainly new material, including a couple of songs she wrote, but the majority of her album consists of songs written by her band members. The daughter of Indian sitar virtuoso Ravi Shankar and Sue Jones, Norah Jones was born in New York, but when she was four, she moved with her mother to Texas, near Dallas, and absorbed the contents of her mother's record collection, including a boxed set of Billie Holiday recordings, one of whose eight discs she would play over and over. For her junior year in high school, she and her mother moved into Dallas, and Ms. Jones enrolled in the Booker T. Washington High School for the Performing Arts, one of whose alumni is jazz trumpeter Roy Hargrove. She did her first performance on her 16th birthday, at an open-mike event, and was soon attracting attention, winning Down Beat magazine's Student Music awards in both the jazz vocal and composition categories. After graduating from high school, she enrolled in the respected music program at North Texas State University, majoring in jazz piano. In 1999, she came to New York for a summer visit staying in Greenwich Village, and ended up not returning to college, staying in New York and absorbing and becoming part of the music scene there. She sang with a band called Wax Poetic and also put together her own group, which eventually got her signed to the jazz label Blue Note Records. She also turned up on guitarist Charlie Hunter's CD from last year, Songs from the Analog Playground. For Ms. Jones recording debut, legendary producer Arif Mardin, known for his work with Aretha Franklin in the 1960s, was enlisted, but the CD is primarily with Ms. Jones' own band, rather than with a group of studio musicians. While jazz is clearly a major influence for Ms. Jones, Come Away with Me is not really a jazz album. There is only one tune that could be described as a jazz standard, and the musical ingredients are as likely to come from country music as they are from 52nd Street. Ms. Jones is a fine pianist, and is heard at the instrument on all but one piece, but this is a very guitar-oriented album, with acoustic guitar probably being the major instrumental voice. And on guitar in her band is Jesse Harris, who wrote or co-wrote five of the fourteen songs on the CD. Also contributing songs is bassist Lee Alexander. Rounding out her regular band is Adam Levy on electric guitar and Dan Reiser on drums, though prominent jazz drummer Brian Blade is heard on several tracks. Also making a guest appearance on one piece is guitarist Bill Frisell. One of the most appealing aspects about this CD is its relaxed, intimate feel. With a heavyweight producer like Mardin on board, and the CD clearly being aimed at wider audiences than the straight-ahead jazz crowd, with perhaps a good helping of more pop-oriented songs. But the CD is remarkably laid-back and surprisingly eclectic. Two of the three cover tunes are country songs, including a Hank Williams classic. And the original material is interesting with mostly pithy impressionistic lyrics, rather than the wordy ballads one might expect from a chanteuse. Ms. Jones herself has a voice that belies her age -- breathy but with an intriguing detached, almost aloof quality. It's also apparent that she has listened to Patsy Cline as well as Billie Holiday. She's a respectable pianist, demonstrating versatility and understanding the principles of tasteful vocal accompaniment. The combination of the difficult to categorize music and the intimate sound makes this a distinctive and instantly appealing recording. The title track, Come Away with Me, is the first of the original songs by Ms. Jones herself. The song's waltz time hints again at country music, while Ms. Jones' vocal performance is a real highlight of the CD. From the world of commercial teen pop icons to straight-ahead jazz, young women performers are proving to be big sellers. That may well have been a factor in Norah Jones landing a recording contract, but on her debut CD Come Away with Me, she proves to be a distinctive and original singer, a fine songwriter and a worthy pianist. The quality of her work belies her age, with her CD a model of tasteful understatement and intriguing eclecticism, with influences running as they do from country to jazz to cabaret, all in a remarkably relaxed, intimate setting. The result is an album that will draw you into its comfortable musical space and leave you wishing to stay a little longer. The combination of the fine musicianship shown by her band and the nonpariel production of Arif Mardin makes this a genuine delight, and one of the most impressive debut albums so far this year. Our grade for sound quality is close to an "A." The mostly acoustic instrumentation is well-recorded, and Ms. Jones' vocals are for the most part nicely captured by engineer Jay Newland. But the CD was compressed some to be louder than it needs to be for this kind of music. With the kind of first album from a 22-year-old that Come Away with Me represents, Norah Jones is a performer from whom we hope to hear a great deal more in the future.